4:04 a.m. Steamboat Springs Police Department officers found a man asleep at the wheel at Central Park Drive and Mount Werner Road. They arrested him on suspicion of driving under the influence and possession of drug paraphernalia. 9:33 a.m. A family noticed footprints in the snow around their house in the 200 block of River Road and called officers to investigate. Police found no evidence of criminal activity. 2:02 p.m. Officers received a report of illegal dumping at a house in the 1400 block of Pine Grove Road. Someone saw a vehicle unload a pile of old furniture on the property. 2:50 p.m. Steamboat Springs Fire Rescue firefighters assisted an unconscious person in the 35300 block of Routt County Road 33. 7:21 p.m. A concerned resident saw someone walking with their dog on the railroad tracks at Shield Drive and 13th Street and called officers, worrying a train might hit the person. 8:02 p.m. Officers were called by an individual who feared their friend was abusing drugs. Police checked on the friend, who denied the claim and said they were just stressed about moving. 10:45 p.m. Officers contacted a man suspected of spray-painting Steamboat Springs Transit buses at Seventh Street and Lincoln Avenue. They issued a court summons for defacing property. 10:53 p.m. Officers issued a court summons to an individual suspected of public urination at Eighth Street and Lincoln Avenue. 10:57 p.m. A caller reported shots fired at Riverside Drive and Honeysuckle Lane. Officers investigated and determined the noise came from people popping balloons for a party at a nearby business. 11:46 p.m. Routt County Sheriff’s Office deputies were called about a reported disturbance at a bar in the 100 block of East Jefferson Avenue in Hayden. 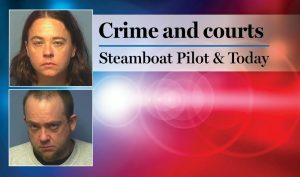 Steamboat officers had 30 cases that included calls for service and officer-initiated incidents such as traffic stops. Sheriff’s deputies had nine cases that included calls for service and officer-initiated incidents such as traffic stops. Steamboat firefighters responded to four calls for service.